​The year 2017 marks the 500th anniversary of Martin Luther’s Reformation, but reflecting on Reformation needs to begin by remembering that Luther’s Reformation was only one of several reformations. The Reformation was not a singular event but a plural set of events. Even concentrating on the period of Luther’s Reformation, he was not the only reformer; Erasmus of Rotterdam and his fellow humanists, for example, were working actively at that time, a period of vehement dissent. Luther’s Reformation theology can be summed up in three ways: the doctrine that salvation is not an achievement of human being, but a gift of God’s grace through faith in Jesus Christ; the conviction that it is not the authority of the Pope, but that of the Bible that is the sole source of God’s truth; and the teaching that all Christians are priests. Luther criticized the church’s sale of indulgences and wrote a letter to Bishop Albert of Mainz, which was attached to the “Disputation of Martin Luther on the Power and Efficacy of Indulgences,” later known as the “Ninety-five Theses.” Many people remembered that Luther nailed his “Ninety-five Theses” on the gate of All Saints’ Church in Wittenberg on 31 October 1517, which is still celebrated as Reformation Day. But Luther’s teaching that “Faith alone justifies us, not works,” has caused problems historically in some Protestant churches around the world and especially in today’s Korean Protestant churches, such as faith without works, and justification without sanctification. In fact, Luther was also criticized for adding the word “alone” in front of “faith,” since it did not exist in Romans 3:28, and also for his attempt to remove the Epistle of James, which stresses the place of “works,” from the New Testament, claiming that any good deed that humans do in order to win God’s favor was a sin. This is a serious problem for the many Korean Christians who have a strong belief in Jesus but do not practice what Jesus taught. The historical inconclusiveness of Luther’s reformation theology still remains controversial. Luther insisted that the lords of Germany crack down on the peasants, when they protested not only for reformation of the church, but also for social transformation, saying, “Therefore let everyone who can, smite, slay, and stab, secretly or openly, remembering that nothing can be more poisonous, hurtful, or devilish than a rebel.” Luther saw the poor peasantry as devils and said they should be brutally killed without any hesitation. From an ecumenical viewpoint, the final difficulty that we face is Luther’s “two kingdoms” doctrine. According to this doctrine, God is the ruler of the whole world, ruling it through law and gospel. God rules the “worldly Kingdom” through secular government, by means of laws and the sword, and at the same time, the “spiritual Kingdom,” by means of the gospel, to enhance human righteousness before God. However, if the worldly kingdom is separated from the spiritual kingdom, there are not many things that Christians can contribute in the political and economic sectors according to Luther’s theological system. A certain kind of intrinsic correlation that the gospel has with historical transformations or social ethics thus disappears. Even though our starting point is the 500th anniversary of Luther’s Reformation we cannot limit our theological reflection to it. 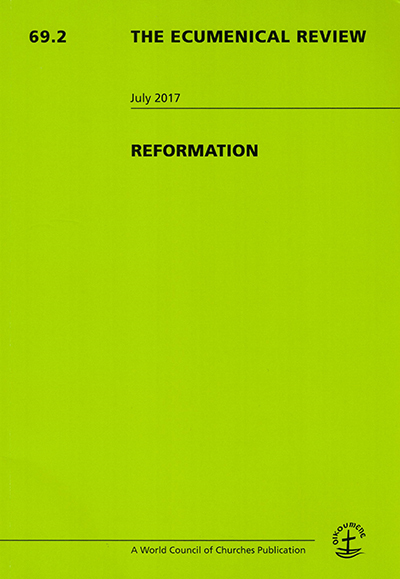 To sum, while 2017 marks the 500th anniversary of the Lutheran Reformation, this article argues that reflection on the Reformation should begin by remembering that the Lutheran Reformation was only one of several Reformations. Noting both the achievements and the limits of Luther’s Reformation, the article proposes to remember and commemorate Jan Hus and the Czech Reformation, which took place a hundred years before Luther. Unlike Luther’s Reformation, which focused on the doctrinal issue of “justification by faith,” the Czech Reformation focused on the issue of the Lord’s Supper and practiced a “social Holy Communion” beyond the boundaries of the church. The Czech Reformation, argues the article, can give a fresh new vision and inspiration to the contemporary ecumenical movement in Korea as well as around the world, transcending a perspective that sees ecumenism as being focused on a fellowship of churches.